Making it Yours (MIY) is all about using the furniture you have in new ways and taking pieces with you throughout your life. In this edition of MIY, our fictional homeowner has moved from a home with a breakfast nook and room for four Real Good Chairs to a new home where the chairs will have to be split up. We’ve already seen the chairs in a home office, graphic bedroom, and vintagey bathroom. Now we’re seeing the fourth and final chair gracing an entryway. The pendant has the same angles and facets as the chair, and the duck egg stacking boxes have just enough of the warm sand color on them to tie in the brass finish of the light. The console table and mirror are simple enough to not compete with the rest of the room, and the little white dish would be an excellent catch-all near the door. The Haseform Dachshund Coathanger is adorable, and the rug add just the right amount of pattern. Dark grey woven baskets and blue/grey walls finish off the entryway. I know that the Blu Dot chair is fairly taste-specific. I like it (obviously), but some of you didn’t. The whole idea of Making it Yours though is that you can take a piece that you love, and keep using it in different ways and at different points in your life. Let’s say for example that you love Chippendale chairs. The accompanying furniture and paint colors may change, but the MIY concept still applies. Here’s an alternate version of the entryway. The chair is from Pieces, and the paint color, hooks, tray, and rug have changed. The concept is the same, yet the look is very different. I hope that gives you some ideas for how Making it Yours can work for you! I absolutely love the MIY segment. It’s very inspiring! I love the chair too! If only we could get it in Australia. I’ll be keeping my eye out for something similar. This is great. And I love that you have provided examples for a different chair. It’s a real reminder that just a few tweaks can make a difference. You have such a gift for pulling things together the way you do…making it lovely & making it work! 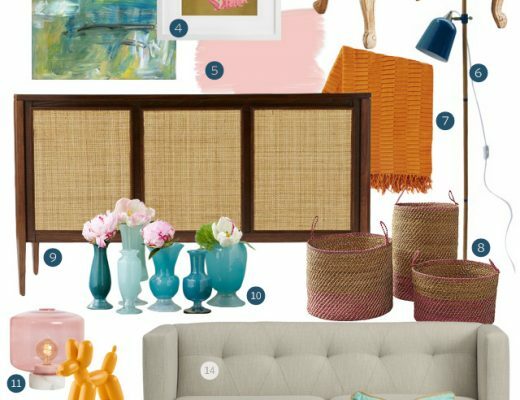 I just placed an order for the Cb2 runway coffee table on Saturday! Now that I’ve seen your post I wish I would have ordered the low contour basket for underneath storage, too. what an inspiring board example! thank you for sharing! Love it! I am about to start remodeling and decorating my aparment. You are my toatal inspiration. 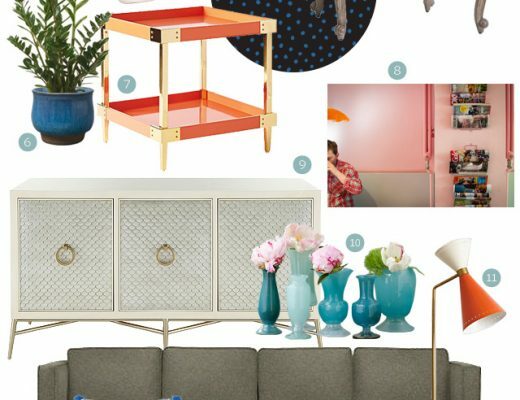 That CB2 Runway Table is so perfect for a space in my living room. I love these boards. Great ideas. That is brilliant! The example of the Chippendale chair is such a good contrast to the cool hues of the Real Good Chair. Amazing what a few small switches will do. 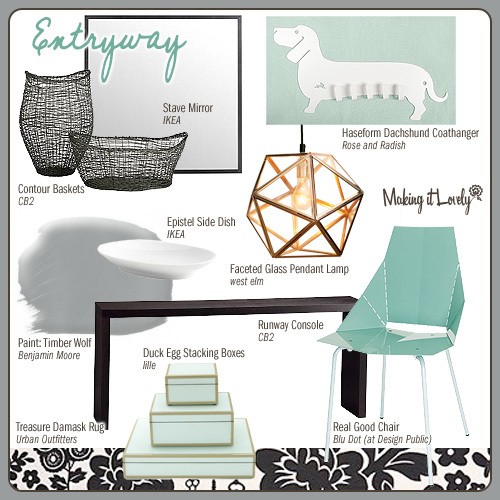 I have enjoyed the MIY series and I totally need that Dachshund coathanger! Damn budget. It’s funny that you mention the Ikea plate… I use the Ikea 365 Serving plate as a catchall on my console. Great minds think alike! i think the chair is great, and i love your picks! Where do you get the graphics of the Benjamin Moore paint colors? I’d like to be able to access them when I post about specific colors on my site but I can’t figure out how to take them off the Benjamin Moore website. Nicole,your picks are stinkin’ hilarious. 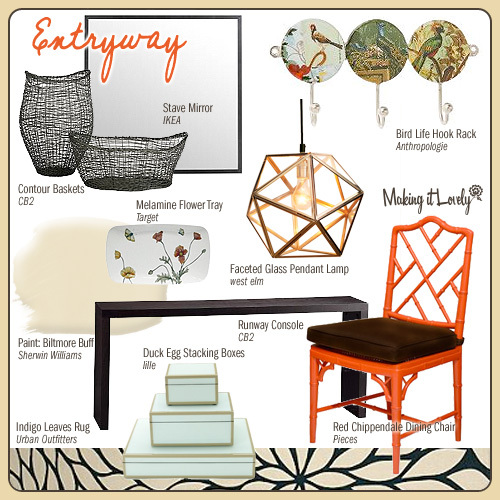 Also check out entryway furniture from Ballard Designs. 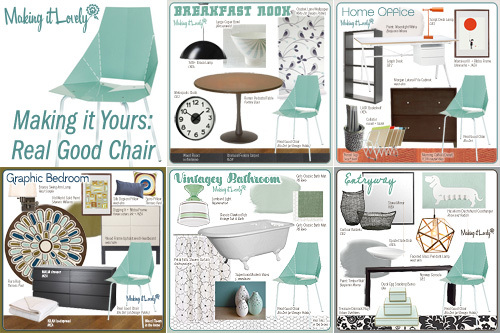 I don’t think I’d love the Blu Dot chair by itself, but I love it when paired with all the other stuff you picked. The MIY feature is great- I agree with the other readers who said that. Inspiring for sure. Love your blog! 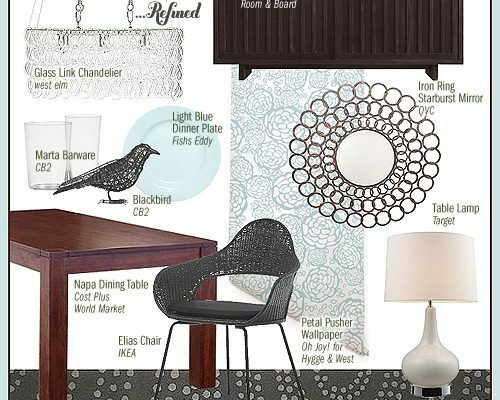 The Blu Dot chair is on clearance on target.com for $90ish.